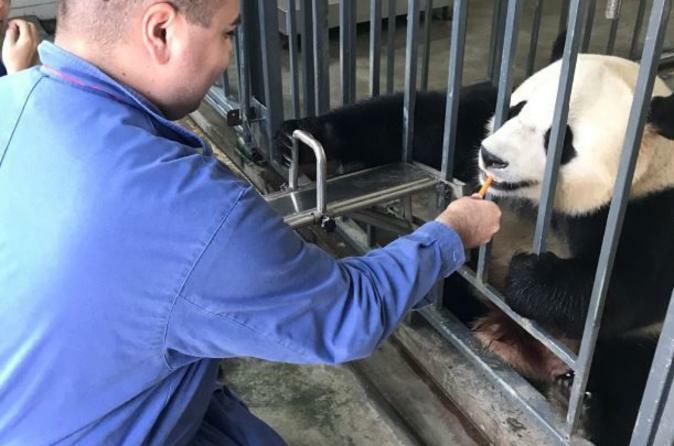 Stå opp i nærheten av gigantiske pandaer under en privat tur til Dujiangyan Giant Panda Centre fra Chengdu. Frivillig sammen med dedikerte dyrevelgere for å registrere oppførsel, rene skap og lagre mat til de søte pattedyrene. Sørg for at de truede arter fortsetter å trives i naturen og i innkapslinger med verdsatt støtte og få fascinerende innsikt i dyrs oppførsel og fysiologi. Ta fotografier med pandasene for å utøve deg minner (egen regning) og nyt en tradisjonell kinesisk lunsj og praktisk rundturstransport på denne turen. Avreise fra Chengdu-hotellet i et komfortabelt minivan med aircondition, og nyt den naturskjønne stasjonen til det ideelle forskningsenteret, ved foten av et hellig fjell. Overfør til en ekskursjonsbuss og stige opp til nettstedets toppmøte for å observere residente pandas som eksisterer lykkelig i replikaer av deres naturlige habitater. Hils de profesjonelle pandabutrene og lytt til korte orienteringssessioner, der dagens reiserute er skissert. Delta i din første fôringsøkt, forberede frukt, grønnsaker og spesielle panda kaker og mate dem til de majestetiske pattedyrene. Revitaliser med en tradisjonell lunsj etter knyttneve noen få timer med frivillig arbeid, og tilbring en times spasertur i de vakre hagene i skapene. Gå tilbake til dine plikter ved å rengjøre innendørs og utendørs panda innkapslinger og registrer deres oppførsel og vekt. Etter å ha spist pandaene en gang, kan du utforske pandasenteret på fritiden. bruk datamaskiner og se bedårende pandavideoer på frivillig service senter hvis du ønsker det. Etter en travel dag med frivillig arbeid, motta en gratis t-skjorte og sertifikat som gratulerer ditt verdifulle bidrag til naturen. Gå tilbake til hotellet ditt i et privat kjøretøy med magiske minner fra dagen din. MY two daughters really enjoyed this experience. Feeding the pandas was amazing and we were really able to get close to them for some great pictures. I have always loved bears so it was wonderful to see what goes into taking care of them here. We actually wish there would have been a bit more work for us to do. It seems they have so many tourists coming through for this that there really isn't enough work to do. My other concern is also that they advertise these Pandas are being treated to be released back into the wild, however we saw no signs that they would be released. It appears they are only being kept for breeding purposes and to raise money from the tourists. All in all it was still a good experience and we are happy to help contribute to keeping the Panda Breed thriving. This is an amazing opportunity to be so close to pandas. I couldn't believe I would be face-to-face with a panda, so close that I could feel their breath while feeding them. All the chores we performed were easy and fun. Our super guide, Jenny, was very knowledgeable of the Panda Center as well as Chengdu. Sam, from Samtour, always responded quickly to all of my questions. Thank you Jenny and Sam for making our visit so magical and memorable. We booked this tour two days in a row and were so glad we did. We'll do this again on our next trip to China. This was definitely the highlight of our trip. This was a breathtaking experience. Special thanks to my tour guide, Jenny. She and the driver picked me up from my hotel in Chengdu City and drove me 90 minutes away. Jenny was with me the entire day and took amazing photos and videos of meshe wasnt allowed to come pet/hug the panda with me, but the staff took photos and videos for me with my iPhone. Volunteer work was easy and not demanding at all. Great exposure to the pandas and seeing truly a magical place. This was a great experience. 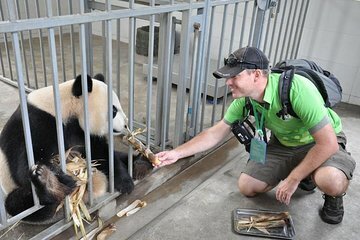 You do get up close and personal with the pandas and the knowledgeable panda keepers. The buffet lunch is local food and fantastic. The guide and driver made this experience exceptional Thank you Worlay and Mister Pan. I would recommend this to any panda or animal lover and any US residents who want to see Bao Bao she looks great. Thanks Samtour, for a great day. Awesome and just the best thing ever. This is a once in a life time chance and I enjoyed every moment. It was educational as well as fun. The lovely lunch was a bonus. My only complaint was the hot polyester green shirt we had to wear. Everything else was perfect. Cleaning panda poo wasn't too hard and was interesting. Of course feeding the pandas was amazing. And surprisingly scary being so close to them. Plus they give you two chances to get the best pics possible. The hour long documentary is very interesting. And walking around the grounds and seeing pandas at play was awesome. We did have to wait in the office a couple times in between activities but we made friends with the other volunteers so we were never bored. And the Chinese cafeteria food was great and plentiful. I would give this tour higher rating if this was possible. The three of us who did the tour together, are still overwhelmed with the experience of working so closely with the pandas. Our guide took excellent pictures of our adventure. Would rate it 6 stars if possible. An amazing experience and one that shouldn't be missed. It isn't some lame just stand around and do nothing experience. You actively participate and it is fulfilling in many ways. This was the best thing my wife and I experienced during our visit. Amazing day! Up close and personal with the pandas! Paying to hold panda was excessive but all the money goes to the sanctuary so it's worth it. Wonderful creatures!